Produced by GLOBE VIDEO FILMS and released July 2001. 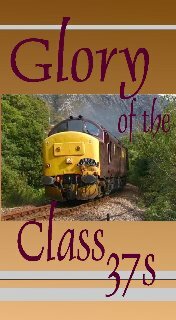 'Glory of the Class 37s' is an extended programme issued as a follow up to the hugely successful 'Reflections of the Class 37s'. Running for over 80 minutes the video includes rare archive video footage dating back as far as 1968 yet brings us right up to date with scenes from mid-2001. Also featured are the final throes of official passenger services in North Wales with unique footage of the last headboard adorned official departure from Holyhead. Featuring no less than 103 different class members in locations from the North East of Scotland to Kent and the West Highlands to Cornwall. Sountrack is recorded in stereo and has to be heard to be believed ! Headphones are strongly recommended.